I'm quite excited to share this manicure with you all today. It's just perdy. The kind where I can't stop staring at my nails. 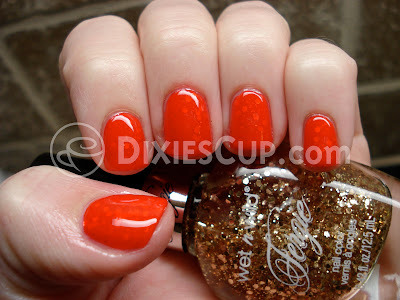 I used two polishes: OPI MonSooner or Later & Wet N Wild Glamorous from Fergie's collection. Thanks to my awesome coworker and friend, Heathen, for the gift of the lovely gold glitter! 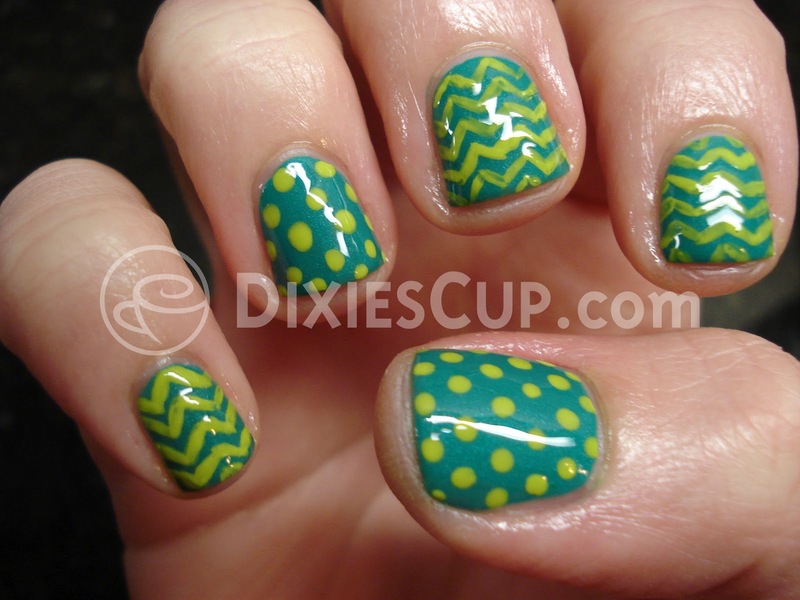 A lot of you have likely heard of a jelly sammich manicure. I suppose you could also say "sandwich", but I prefer the term "sammich" because it is fun to say. 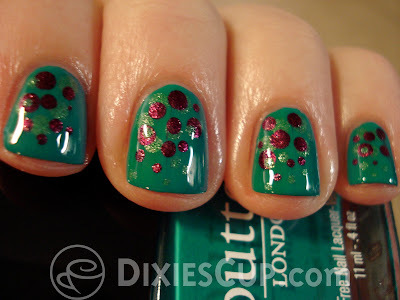 Anyway, for those of you who are NOT aware, a jelly sammich simply consists of a jelly nail polish and a glitter. 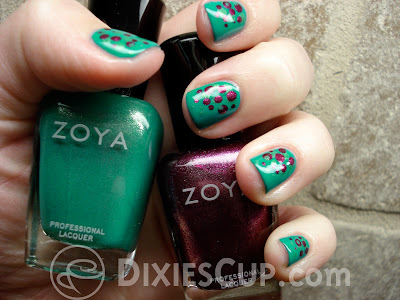 You paint a coat or two of the jelly polish, followed by a coat or two of the glitter, and then one last coat of the jelly polish. Hence the term "sammich" because you've sandwiched glitter in between the jelly polish. 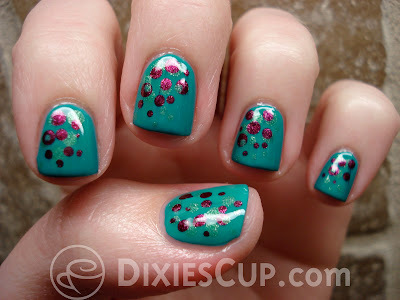 You must use a jelly-type polish because they are fairly sheer and this allows the glitter to peek through. Each jelly varies on its level of sheerness, and the one I chose was not as sheer as I would have liked, but it still worked well enough. I tried to take several different shots that might show the glitter a bit better, but unfortunately the photos do not do this justice. It was a lot easier to see the glitter in person. I REALLY love the shade of MonSooner or Later. 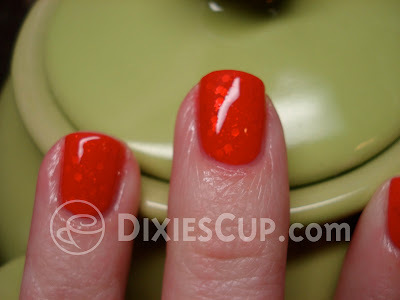 It is a shiny orange/red jelly that is fully opaque in two coats. 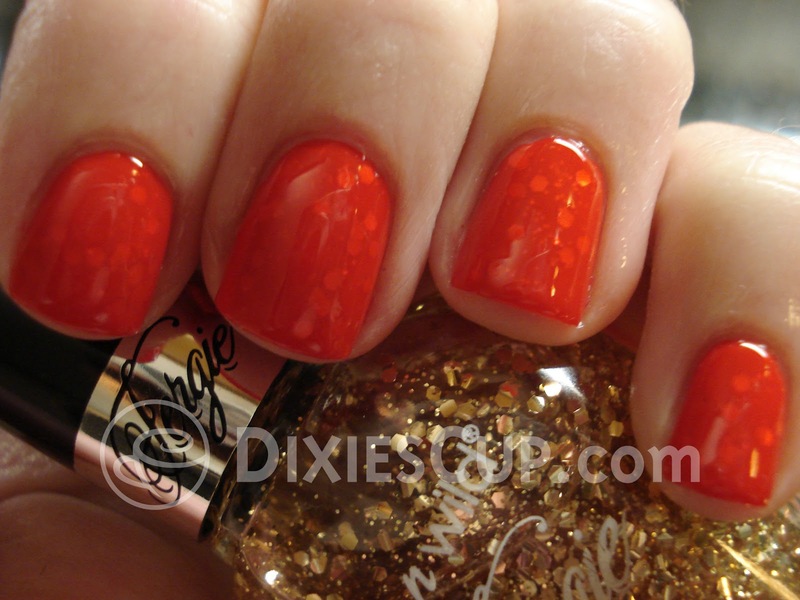 This is the first OPI polish I ever purchased, and I bought it over 6 or 7 years ago. 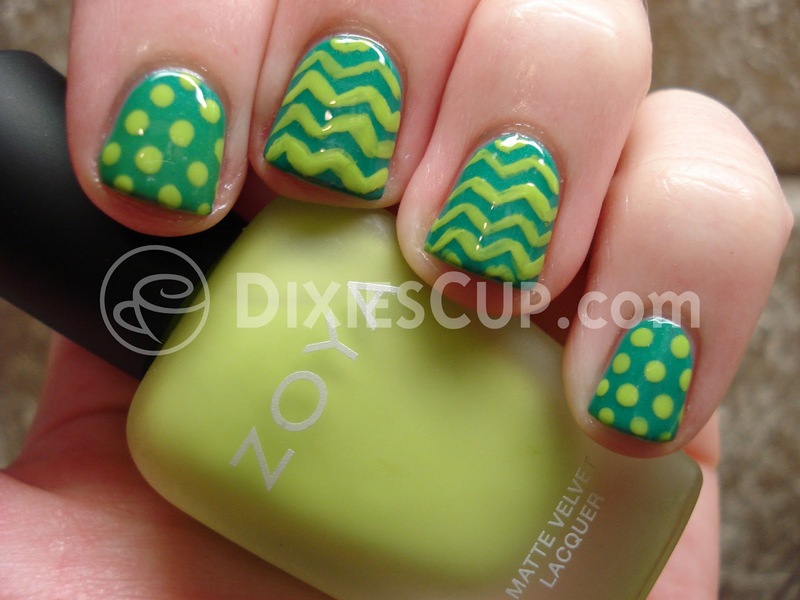 It is such a versatile color and has the typical great formula of OPI polishes. I can't believe I haven't used this polish more, I just forgot how awesome it is. All of these photos have a base coat, two coats of MonSooner or Later, two coats of Glamorous, one more coat of MonSooner or Later, and one coat of a fast-drying top coat. Believe it or not, all of that wasn't terribly thick on my nails. And since these polishes dry fairly quickly as it is, there were no major smudging issues. Today I am writing about my June GlossyBox. I am behind as usual on the beauty box reviews, but there are usually products in each box that I really want to share with you. This box has been one of my least favorite so far, but I still love the surprise of what is in the box each time. This is the leaky culprit. I also didn't really care for this sample, which is unfortunate because this is the one that they sent me a replacement for. I finished off the first one, but I just haven't gotten around to the second. I can't quite put my finger on what I didn't like about this, but I just didn't like it. This product wasn't all that bad. It moisturized quite well and made my hair feel very soft. It also smelled quite nice. This is one thing that beauty boxes LOVE to send. Moisturizer for the hair. Because of that, I've discovered quite a few that I like, but none so far that I just cannot live without. I likely won't purchase this, but only because I know I'll probably get another sample next month and I still haven't finished several of my other samples. As you'll see below, I swatched this on my hand. Other than that, I haven't touched this product. It looks cheap, like something you'd purchase at the dollar store, but it is nearly $15?!! Not to mention I'm not a fan of cream eyeshadows. SO.... that's all I have to say about this one. These are nice little samples of some anti-aging creams. I've used them and like them well enough, but definitely do not see results that will make me shell out the dough they want for each product! I'll use them until they are gone, but that will be the end of my relationship with this brand. Finally, we have the required perfume sample. It smelled horrible. I can't even explain the smell because I took one sniff and just about choked. I took another sniff just to make sure I wan't mistaken, and I wasn't, so I chunked it in the trash. Most of the time, if a perfume sample is not up my alley, I'll think about giving it to someone who might have a different nose for perfumes than I do. However, this one didn't even get a second thought before it found its new home in the garbage. Well, that's the June GlossyBox. I tried to keep it short and simple. Thanks for reading! It has been a long 14 days since my last post. In that post 14 days ago, I mentioned that I had been enthralled in a book. That is still true, except it is a different book now. TOO MANY HOBBIES! Anyway, below are some fantastical photos of a couple of nail polishes that my friend Maryana gave me. These polishes are from Forever 21, and both of them are labeled as "Grey". Is that darker grey not gorgeous?! 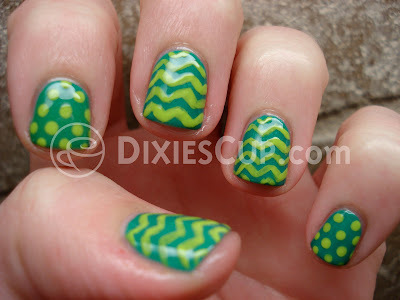 It has a golden/greenish shimmer to it that is really eye-catching. I love it. And Forever 21 polishes are so cheap! The labels on these bottles say $2.80, but every time I go in that store they are on sale for even cheaper. So this particular post seems like a great opportunity to mention that I prefer to spell the word "GRAY" with an *A* and not an *E*. I've used the E up to this point because that is how it is spelled on the label on the bottles, but I felt the need to clarify that I am an A kind of girl. I'm aware that it is technically correct either way, but I just get all irritable when I see it spelled with an E.
The formula on these polishes is great. I had no issues at all with the application. 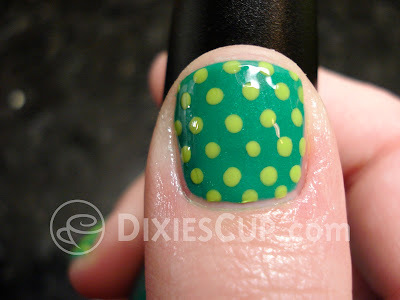 What you see in all the photos is two coats of each color, also with a base coat and top coat. I also used Essie's Luxeffects - Set In Stones to add a little bit of sparkle to my accent nail. It is practically impossible to detect on the nail, but the lighter gray polish has a slight shimmer in it as well. It is a silvery shimmer in the bottle, which I tried to show in the photo above. I apologize for my absence. I go through cycles with blogging and reading books. Currently I am enthralled in a new book and I'd rather read it than write a blog post. However, today I spent a lot of time painting my fingers & toes and I really wanted to share them with you. I'm excited with how they turned out! Here's your fair warning that there is a photo of my toes at the very bottom of this post. I spent too much time pampering my feet today NOT to share them. I started with Sinful Colors - Rise and Shine (courtesy of my good friend Hailey). My intentions were to do a variety of things. I first considered a gradient, and then a jelly sandwich, and then a gradient/jelly sandwich combo... as you'll see I ended up doing none of the above. I finally settled on zig zags & polka dots from some inspiration I got on Pinterest. The first photo that was taken with the flash of my camera is a more accurate idea of what the color looks like. And both of these photos are without a top coat, so you can see it dries to a satin finish. Alrighty then, that's it for now. Thanks for looking at my gross feet!